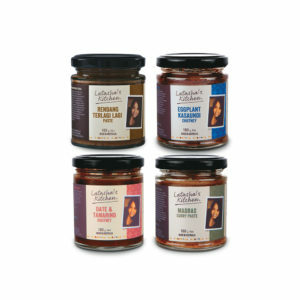 Our range of concentrated pastes, condiments, chutneys and simmer sauces enable you to make and share good, honest food with your family and friends, whether you’re a novice or professional cook. We take away the fuss and mess of having to shop, prepare and cook from scratch by doing all your flavour preparation for you. Our products are versatile and strongly influenced by the flavours of South-east Asia, North India, Regional India and Australia. 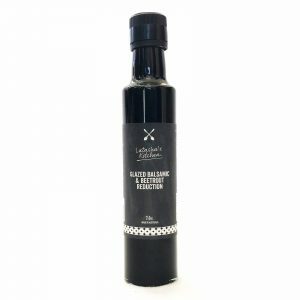 This deep luxurious vinegar works well as a glaze with roasted and grilled meats such as sausages, veal, duck and beef. Also pairs well as a finishing vinegar for baked salmon and vegetables. Combine with extra virgin olive oil as a dressing for lentil patties and haloumi. Delightful drizzled over goats cheese. 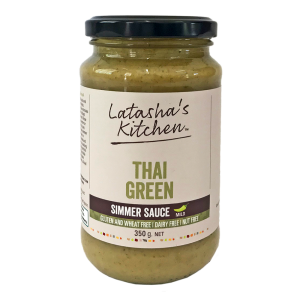 A fragrant Asian spice blend perfect for salad dressings, vegetables, rice dishes, noodles, marinades, soups, seafood, meats, BBQs and added to curries. Filled with an aromatic blend of spices and peanuts you’ll love the flavour it will bring to your dishes. A simmer sauce for everyone! 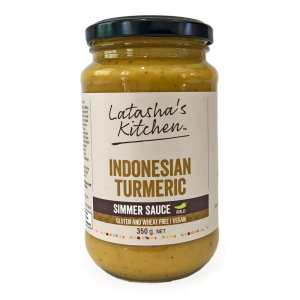 It’s hard to resist the mild and irresistible flavours this exotic Far Eastern inspired sauce is made of. 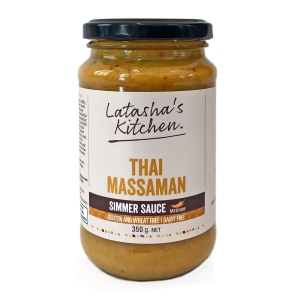 A sensational hearty classic Massaman Simmer Sauce bursting with Thai flavours and traditional ingredients. It’s spicy, tangy with an underlying sweetness and is an tasty quick option for busy families! 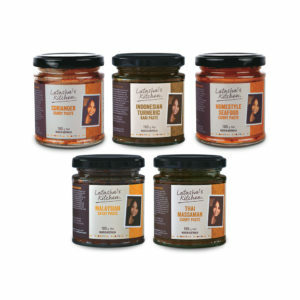 Add some dark beauty to your kitchen with this collection of sweet and spicy flavours. Bold flavours bursting with loads of character and oomph. Feeling tense? 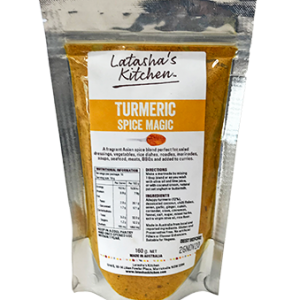 Slip into a mellow calming mood with our award winning range of yellow turmeric based curries. Under the weather? Stock up on our range of immune boosting flavours: Green is a restful colour with some of the same calming attributes of blue. 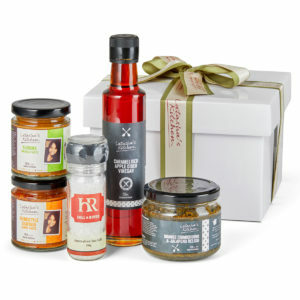 If they like a bit of heat in the kitchen then buy them a Red Hot Favourites Hamper from Latasha’s Kitchen. 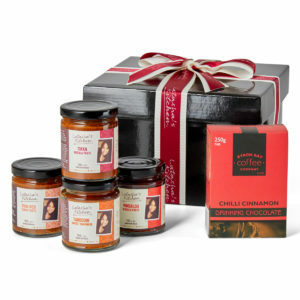 They will love this combination of red hot curry pastes with a tickle of chilli drinking chocolate. 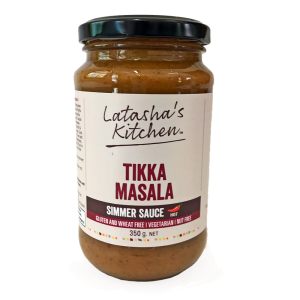 Seafood lovers will adore the Seafood Bounty Hamper from Latasha’s Kitchen with it’s delicious collection of curry pastes, relish and dressing to match, lightly seasoned with salt flakes. Memories are sure to be made if you buy an Asian Bonanza Hamper from Latasha’s Kitchen. 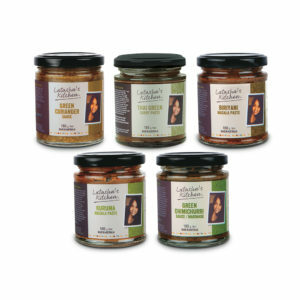 Seven amazing Asian curry pastes, delicious chilli oil plus the aroma of Asia from a scented candle. Inspired by festive banquets, this Royal Festive Banquet Hamper from Latasha’s Kitchen is quite simply the perfect gift for those who love to entertain on a grand scale. Buy a Bombay Dreaming Hamper from Latasha’s Kitchen and recreate the culinary treasures from the melting pot of Bombay’s food culture. Packed with a mouth-watering array of authentic curry pastes and ginger choc macadamias to finish.